Traditional profit and loss reports are widely used in financial reporting, and are often necessary, but can be difficult to understand. This is especially true if you are looking for trend and comparisons. This guide looks at various ways in which you can make your financial reports stand out with clarity, trend spotting and improved readability while still remaining accurate and reliable. In traditional profit and loss reporting it is common to produce a monthly report, a quarterly one and an annual report that shows the current time period (quarter or month), YTD and perhaps comparison to last year. The annual report might show you a breakdown of each month or quarter in the year. You need to ask yourself why you’re not able to see trend and historical comparison in all of your reports. Would you not be able to see your business more clearly if you knew the direction it had been heading in for the past, say 12 months without having to pull time consuming reports to do so? If you do want to see that trend using monthly P&L reports, you need to combine those reports and pull them together, which often generates quite a lot of work in Excel formatting and combining the data, and then next year or quarter or even month, you have to do it again. In some cases, it might not seem like it’s worth the effort. But seeing that trend is invaluable and having it readily available can make a huge difference. With a reporting system which is connected to your financial data or accounting system, you can have trend and all the historical data you need automatically. It would be readily available at any time you wish to review how you’re doing compared to the past few months, the same month last year, or even how your current YTD is doing against last year’s or the one before that. These are important factors to consider when making the most of your business data, and having them readily available rather than buried in several different reports is going to make a huge difference. Include trend data, and charts, for improved context which makes your reported results more meaningful. A large part of creating efficient, readable financial reports lies in formatting your data to show you what you need. It is important to bear in mind that your data in itself shouldn’t be your final reporting output. However, to produce the optimal end result, you have to have a strong foundation – that foundation is your data. When you receive a monthly report formatted by your accounting system or in excel, the data is laid out for a person to read and understand. It probably contains calculations, summaries, totals, various headers and other elements needed to make sense of the data. If you’re using this data to create reports, it will not be very efficient as it doesn’t automatically slot into the format used by most reporting systems. For example, to be able to create the trend we talked about in the previous section, that trend needs to be available in your data. In fact, your data should be a running historical record of your financial activities. This way, it is easy to make comparisons, group months together to create quarters, YTDs and full years – but it will not be as easy to read as the reports you are used to. However, you will not be looking at the raw data in your finished reports. Your reports will be made up of charts, summarised tables, scorecards and gauges which will give you a complete picture of your data which is much easier to interpret. Keep data raw so that reports and dashboards can easily create charts, graphs and make necessary calculations without manual intervention. With this setup, you can create any number of charts, scorecards, table summaries and other visuals. They will work historically and with trend. You will be able to filter charts and dashboards by your various categories. You will also be able to make comparisons, analyse YTD and add calculations such as % profit, variance and run rate. When working with reporting data, consistency is imperative. 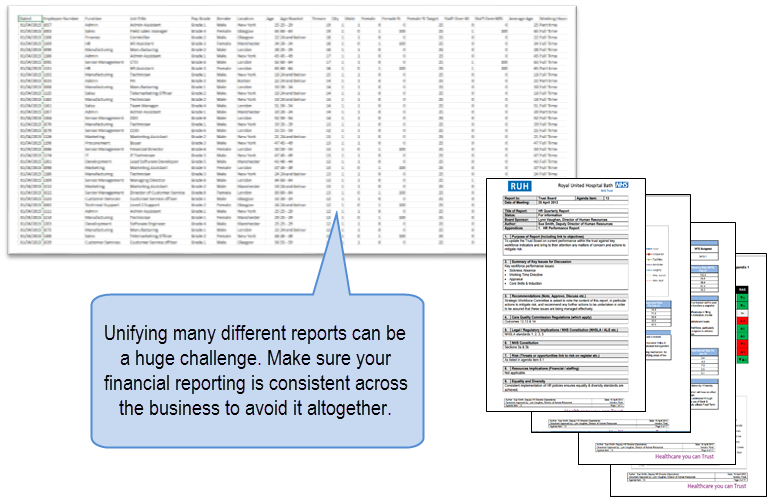 If your reporting categories and metrics are not consistent across the business in how they are recorded, formatted and measured, how can you make comparisons? For example, if you have three different revenue streams that all need their own report, those reports should work together in a way which gives you an overview of the whole business. In many cases, however, reports develop over time – as do KPIs and metrics – and consistency is not always a given. When that happens, creating summarised reports for company executives and board members becomes time consuming and difficult. When you have a differently structured report for each of the revenue lines or business units which contain different metrics and targets, it is a big job in itself to unify them. A reporting system like Target Dashboard will be able to link all of these consistent reports together to produce a summary report for your whole company. Once you have the required consistency in each of your financial reports, you can add in uniqueness. Perhaps one of your business units have a couple of reporting requirements that aren&apos;t relevant anywhere else – now you can add them in. If such additions follow the format you&apos;ve set up for your reporting, you will still be able to combine reports for a summary. Consistency is essential - whether you compile yourself or use an automated system like Target Dashboard. If errors are introduced into your data and thus into your reports, you run the risk of making the wrong decisions based upon them. Making retroactive changes to a report because of a manually introduced error usually isn&apos;t a popular move. Therefore it is imperative that you work to eliminate errors in your reports and reporting data. By far, the largest source of errors in data entry, calculation and formatting is human error. It might be something as simple as a typo, to information being left out or a formula that&apos;s not been set up correctly. They might not seem like much, but in each of these cases, the error can be just a severe. For example, an extra zero at the end of a number multiplies the affected figure by ten, vastly inflating the number. Or what if a couple of rows of invoices are left out of your income data – it will instantly become incorrect. There are many such examples, and for accurate reporting, none of them are acceptable. This is why you should work towards a reporting setup which requires as little manual data processing and handling as possible. Achieving this might be easier said than done, especially if your data comes from many different places in many different formats. This is where the previous point on consistency in your reporting data should be taken into practice. If your data is already consistent, there will be less manual work manipulating it to produce reports, and less risk of errors. The optimal solution is to automate your data entry entirely. Connect your reporting solution directly to your data to avoid processing the data manually at all. The benefits of this are not only that your data becomes more accurate. You can also allow it to be more detailed and have it update your reports more frequently. Try to avoid manual processing of your data as much as possible when reporting upon it as this can introduce errors. To cut out manual data handling altogether, consider automating the flow of data between your systems and your reporting solution. Finally, when your reports are up and running, when your data is automated and you have the charts and visuals you want, you should make your reporting outcomes available to others. The point is that your reports won’t do anyone any good if nobody can see them. The problem traditional financial reporting often faces is that the reports are static and only comes out at specific times, say once a month or once per quarter. This is no good in the fast paced world we live and work in. 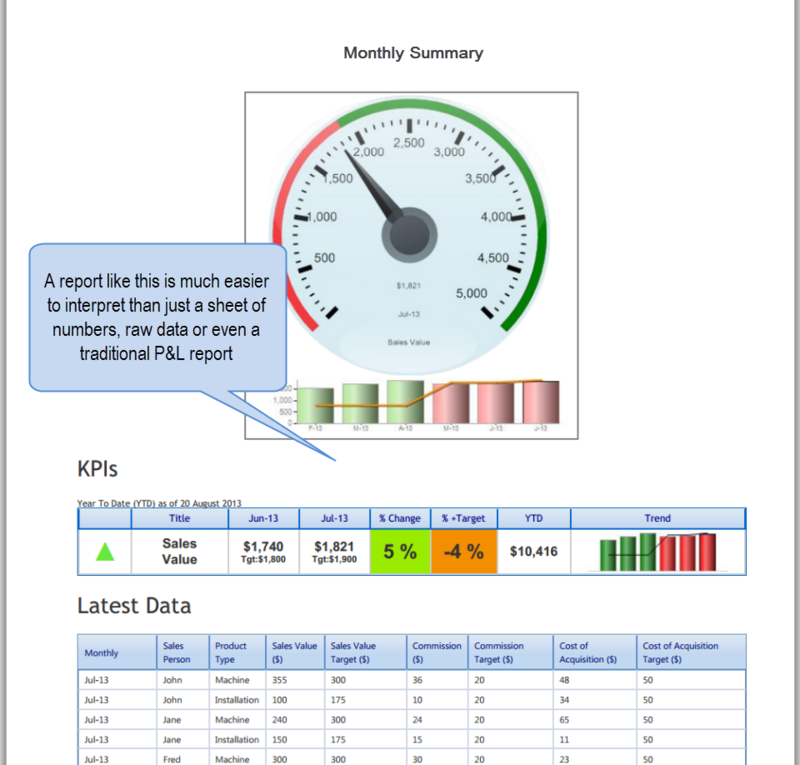 If you are using a cloud based reporting solution like Target Dashboard, this is easy. You can invite other people in your organisation to view your reports whenever they need to, and if you have automated your data entry, you can rest assured they are up to date at all times. If you are using a reporting system with the ability to invite users and set up security permissions, make the most of it by setting up user groups, giving role specific access and creating email alerts for important information. Your colleagues, management team and stakeholders would then be able to log in at will to check the status of the KPIs that matter the most to them. 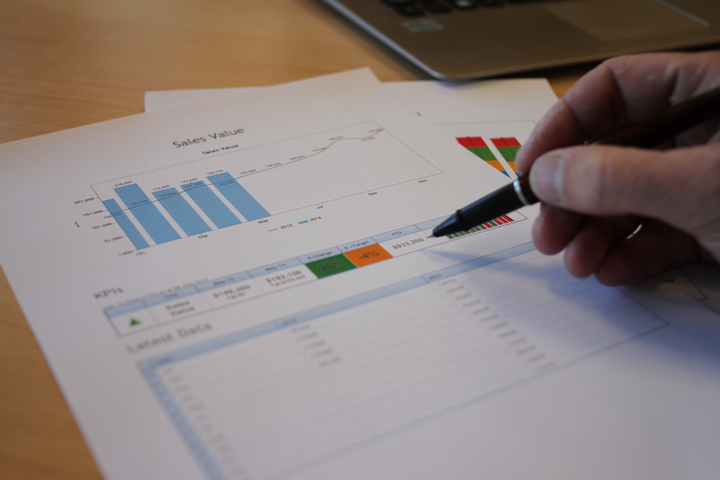 A software claiming to do reporting should also be able to generate more traditional reports that can be printed and shared in meetings as well as dashboards, presentations and extracts of data to go along with the reports. Reporting should be dynamic, accurate and easy to access, not a chore that produces a dry, complicated output. When you have all of this at your disposal, alerting the relevant people to potential issues in your figures is easy because they’re right there. Never again will you have to wait for a report or request one from a system administrator, nor will you ever have to worry about the figures in your reports being out of date. Sharing recurring reports should be automatically generated and distributed to a pre-approved list, and not require the finance team to remember an email must be sent to X at every Y interval. The right tool for the job can make all the difference! 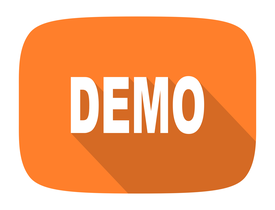 See how you can use Target Dashboard to manage your financial reporting, ease data collection and share automatically.